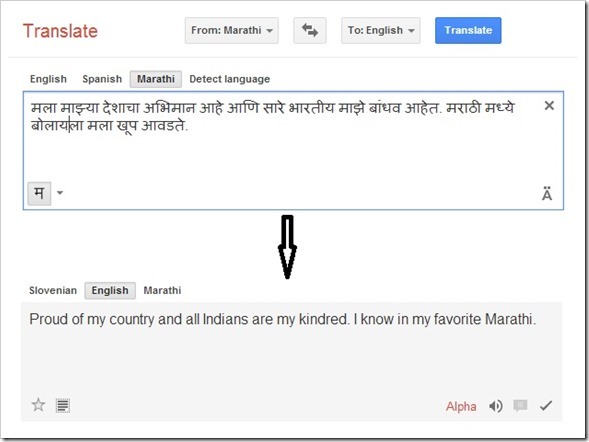 Google Translate adds 5 New languages, including Marathi! Google Translate, web’s most popular translation engine has added 5 new languages to its stable taking the total tally to 70 languages. As far as Indian languages go, there is yet another new language added – Marathi – a language spoken by over 73 million Indian people in India. Google translate already has support for 7 other Indian languages that include Bengali, Gujarati, Hindi, Kannada, Tamil, Telugu and Urdu. According to Google announcement, the new languages (except Bosnian) are launched in “alpha”, which means they are not really perfect, and will improve over period of time. 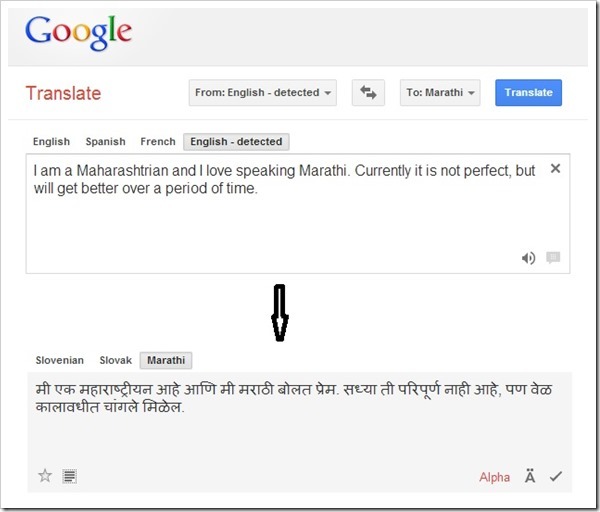 I tried using the Google Marathi translator with not-so-simple sentence and the results were surprisingly good. The sentence formation was expectedly not perfect, but it did the job quite well. A Marathi person can easily make out the gist of the sentence. See the example below. While English to Marathi translation is decent enough, other way round was not really that impressive. The engine is still far from being perfect when it comes to understanding various Marathi words and their variants. Check out the following example of Marathi to English translation. Having said that, I can definitely say that the quality of output that Google translate offers is far better than any other translation engine available out there! Few days back, we wrote about translation business and its potential, especially in the online world. Even today one of the reasons that Internet has abysmal penetration in India is lack of local language content and applications. Google understands that and adding new languages is definitely the right step forward. So if you are a ????? ????? (Marathi man) and not too comfortable at understanding Marathi language, you now have a place where you can convert english text into assal ?????. Go ahead, give it a try and let us know what do you feel! Foodpanda bags USD 20 mln funding! It’s not yet as accurate as you’d like it to be but we can suggest corrections once it is launched in Beta version. It’s an excellent start to have the language in Google’s repertoire! ???? ??????? ???? ???? ?? ??????? ???????? ?????????? ?????? ????? ???? ???. Arnika – Sorry…seems there is some problem with language encoding… I will fix it and the comment in marathi should show up…Sorry for that! Marathi madhye translate karoon lihaylaa pahije hotis :) ingraji madhye lihinya peksha….